My name is Amira and I graduated with a bachelors in Psychology from the University of Michigan-Dearborn. I then received my masters degree in Social Justice from Marygrove College in Detroit, Michigan. I was a substitute teacher in Michigan for 3 years, an after school math instructor for 10 months and an ELA summer school instructor for 2 months before relocating to the Bronx in the summer of 2017. I mostly taught and tutored k-3, but have out of school experience with 4th-5th grades from my own siblings, my 10 year old son who is in 4th grade and kids from my old neighborhood. I love being able to witness a child's happiness when he/she finally understand something they have been struggling with! That has always been a top goal for me and a reason to keep tutoring and teaching. I want my students to benefit from my experience and feel absolutely certain in their abilities. I took many math classes in college. I took algebra, pre-calculus (mostly trig), and calculus. I keep refreshing my algebra knowledge so I am up to date with it. Elementary math, I have experience with it from my time as a substitute teacher and an after school math instructor. I am a fluent Arabic speaker. Coming from a middle eastern background (Yemen), I was taught Arabic from a young age alongside English. I can read, write and speak it. I taught ELA for 2 months in a summer school program and had to come up with creative ideas for students to understand concepts. We played games, worked on the computer, and played many "battle rounds" of "how many adjectives can you list in 30 seconds?" The students loved that game! I am a compassionate, honest, and trustworthy person and I would love the opportunity to tutor students to the best of my ability. I welcome any resources parents may have for me! And I am open to any questions, comments, or concerns. I come from a middle eastern background (Yemen). So Arabic is my second language. I have been learning it and speaking it fluently since my teenage years. 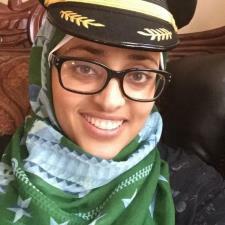 I spent 6 years in Yemen; 4 of those years I was enrolled in an all Arabic public school where all subjects were taught in Arabic. I can easily speak, write, and read the Arabic language.